Its a new feature jp got last month. Basically, when you pull a dupe you also get anima lenses, and you can use them to buy relics from a shop. Moreover, you get Anima Lenses from beating fights in weekly events. The bosses in fests had anima lenses as rewards as well. Finally, you get a boatload from completing the Record Dungeons. Interesting. Is it just old relics? Looks like Raines Triplecasting in JP was a bug and the correct new change to elemental LM's is now as follows. You could say that DeNA......Rained on the parade. Out of curiosity, what server(s) did you play on. I was on Ragnarok. I was on Siren, BLU main. I think I remember seeing you on the BG forums. I went by Ibisariot there., though I didn't post a whole lot. I like how they refrained from including like literally every BSB I'd still be interested in going for, haha. Is there some weird cut off date for these relics? Seems odd to include ability doubles like Vivi and Orlandeau yet omit Maria and Palom. Still, lenses being retroactively awarded is awesome. Yeah that was me on BG. I still pop in there every now and then, but not every day like I used to. I was Red Mage and Samurai mains with a side of Warrior, Ranger, and Corsair. Anyway back to the regularly scheduled FFRK talk. I'm looking forward to the anima lenses, it'll be nice to be able to fill out missing SSBs and BSBs for high usage characters for those sweet stat boosts. Saved up enough crystals to be able to r4 the upcoming dark mage ability. Then saving mythril for bartz aasb. He's such a super star already I need that. Anyone else on autopilot until 4a? But btw, anyone know when I can expect those dark 6* to drop? Bartz AASB. It's far too versatile to not try and pull for. Im just saving Mythril for the Squall Waifu Pull in a few weeks. 315 myth saved right now. Pulled Machina BSB in the daily this morning, nothing special but it was my first non-dupe in a while. Need water wind and ice chains. I believe 6* dark abilities will drop with FF2 Torment. Which comes last, and actually came after 4A in JPN, but could come before 4A for us. I think it might depend on when they drop 5* Holy magicites though, because they were tied to that release. man I was looking at the upcoming banners...is Delita good? I mean I'm looking at the content I haven't cleared yet (D280 FFT Torment and Farming Hades) and I wonder if it'd be better pulling on Banner 1 or 2 to buff up on this realm. Ok I have farmed enough crystals to r4 every 6* ability I want that has been released in the Japanese version so far. I'm actually Ruby constrained at this point, just waiting until I can clear some d??? torments. This will change once the lightning celerity ability is released at the end of the month, but for now I'm good. For anyone who doesn't know, ffrktoolkit has an orb cost calculator where you can enter in your orb inventory and the abilities /rank you want and it will tell you exactly what you need for those. It makes farming much more efficient so I'm not wasting time on orbs/crystals that I don't need. The 2nd banner is much better for FFT Torment/Hades. Delita is an okay character but most people don't use him for the torment as FFT has so many good Holy Knight characters. The 2nd banner misses out on the Holy Chain but has most of the best relics for the realm which would be great for both Hades and the Torment. Thanks! Well I'd better keep farming mythril then! Got another disco on the daily today. My third. BUt it was a dupe of Rosa USB. Really good pull on the half-price earth draw. Maria LMR - been wanting this for a while! Wow. This is the first lucky draw I've skipped. I have literally every relic already except Maria ASB. Even the LMR. I was shocked to learn I have 5 dupes on the earth banner (Ingus CSB, Bartz BSSB3, Rinoa LMR, Cinque LMR, Dorgan LMR), which makes the banner a non-starter for me even though I could use better earth mage stuff. Picked up rinoa USB off the lucky. Also got larsa lmr from daily today. Not bad, nothing to rely on, but selphie lmr has saved me a couple times. Also got larsa lmr from daily today. Balph signal has been triggered. I've been too scared to even attepmt 5* magicite for the past month and a half so I'm sitting over here farming 4* preparing g. Maybe I could take one down maybe not. The enrage mechanics have me scared. Of the elements I have I think I can bdl in dark, fire, and now earth thanks to rinoa. Oh and lightning but my lightning game is weak. Unless you've got a really strong team in a particular element, it's recommended to start with the lightning (earth-weak) magicites. You can use Stone Press against Quetz to break its nasty savage mode, and it's actually recommended to leave King Behemoth in Savage since you do a lot more damage while his Savage is up. 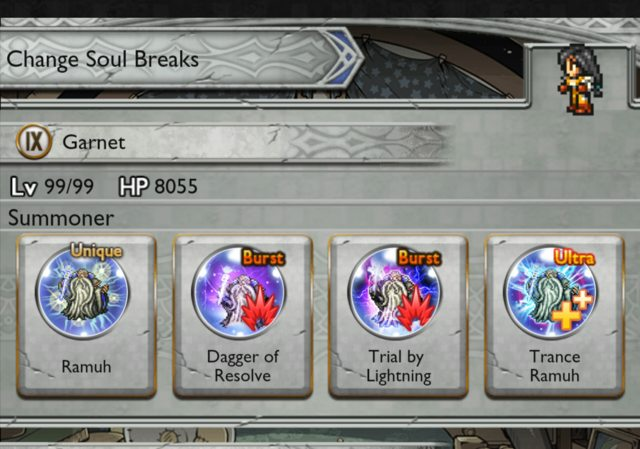 Once you can get a L99 of each magicite, you use them to break the savage of the next magicite in the wheel. Decided to skip the lucky draw as I have consistent clears of the 5* Lightning Magicite. Just finished farming up a lv 99 copy of both. Going to attempt Geosgaeno and Famfrit in the near future. 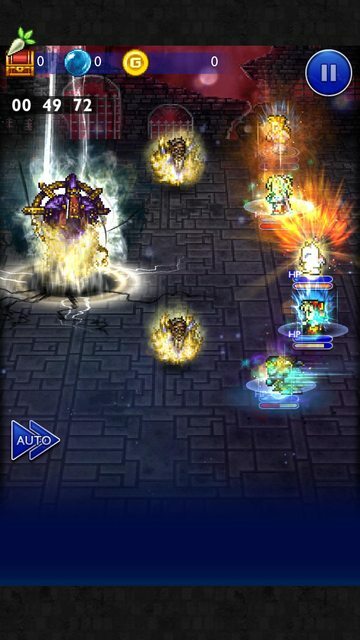 Famfrit should be easy with Lightning/King/Prompto team. Still unsure who to use as a 2nd DPS for my Geosgaeno team. Right now I am thinking using Ashe with USB/OSB, Garnet with CSB, Tyro LMR with Godwall and Elarra with USB. For the 5th character I was thinking rather Desch with SSB/USB or Shantotto with BSB/LMR2/Glint. Not sure who would be a better fit yet but I don't have much for mage lightning characters outside of that. I'm thinking LD Desch and using him would be the better option. 1/11 - Maria AOSB from the Earth LD. Pretty nice. Haven't tried Behemoth King yet, but I think this should cinch it with the rest of my setup. Really would've liked something for Cinque, though. I wonder if just using Cloud as the Stone Presser with USB1 would work for Quetz. My 2nd d??? complete! Mog's BSB fell into my lap with the last RoP and it was the final piece of the puzzle. What's in the 4th fest? Scar: The introduction of Arcane Awakenenings (a.k.a. AASBs), the biggest single powercreep relic boost in the game's history to date. Do we have a list to see what's in each banner? And when is it supposed to drop? I might ignore the tactics banner if its close. Bannerss will arrive with 4th Anniversary, which should arrive 29th March or so. Was just looking at the banners earlier today myself and wow banner 3... Terra + Bartz AASB! Ok, will save my mithril for this. Just keep in mind fest banners tend to have some changes in global compared to jp. Desch finally gets something new in JP. Thunder Mag chain 2.0 + a LMR with IC1 + Haste. And just like Vincent, he can use Machinist to support physical, despite being a mage. Shelke is the biggest surprise, getting a decent support USB that does lots of hits + breakdowns at the same time. Another Kingdom Hearts collab coming in Feb. Not sure if it’ll be a simultaneous release like the last one. Also, free gen1 style Lightning chain for Reno in a new element themed event. Tweet says the event will be held worldwide! Early AASBs here we come! KH3 hype! Last one made too much money for DeNA not to do another one. Early AASBs, here we come! Also bet on 20+1 AOSB2s for Sora/Riku. Don't forget a possible Cloud AASB2! My mythril plans are in absolute shambles now. Can you imagine if this banner had 3 AASB? Yeah this is totally throwing a wrench in my 4A plans. Awesome news. I have both aosbs and nothing else, so they've never been used. Nabbed gaffgarions lmr in the daily pull, so that's something. Have his bsb so he isn't completely useless, just nearly so.